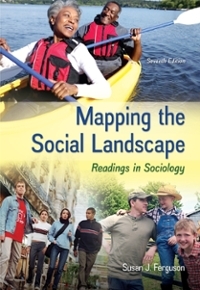 Mapping the Social Landscape 7 Edition This best-selling anthology provides excellent coverage of key concepts in sociology including culture, socialization, deviance, social structure, social institutions, and social inequality. Drawing from a wide selection of classic and contemporary works, the 58 selections represent a plurality of voices and views within sociology. Students will be introduced to cutting edge scholarship and perspectives through classical readings from great thinkers like C. Wright Mills, Karl Marx, Howard Becker, and Max Weber and contemporary articles on current issues like gender socialization, healthcare reform, and minorities in the power elite. By integrating issues of diversity throughout the book, Ferguson helps students see the interrelationships between race-ethnicity, social class, and gender, as well as how these relationships have shaped the experiences of all people in society. Each selection is preceded by a brief introduction that highlights the key sociological concepts for students consider as they read.